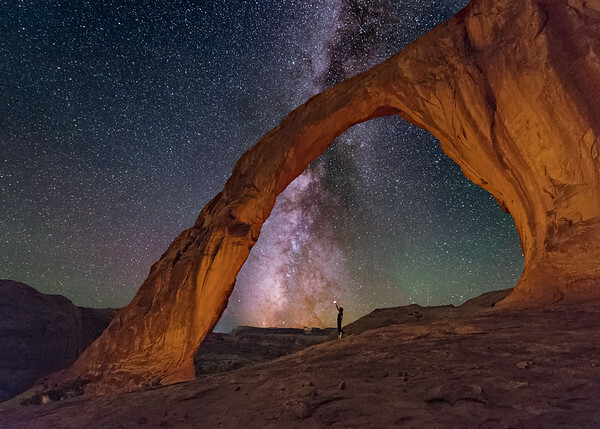 These are 2 one night mini workshops or field trips associated with and occurring during the Nightscaper Conference in Moab, Utah which occurs May 1-3, 2019. The First Annual Nightscaper Conference will host up to 150 Nightscape photographers and is a great way to socialize and network with other photographers. The goal of the field trip will be to practice and learn Low Level Lighting and practice the techniques of Landscape Astrophotography. The Nightscaper Conference will schedule lectures during the day and there are optional "field trips" during the night hours to shoot the local landscape and night sky. These 2 excursions are associated with the conference but led independently.These "field trips" are to Corona Arch. The drive is approximately 14 miles. The hike from the parking lot to the arch is approximately 1.25 miles one way or 2.5 miles round trip. Difficulty is rated mild to moderate. There is a 480 foot elevation gain. There are a couple of sets of safety cables and one small ladder along the trail for convenience and to aid in safety on steeper areas. 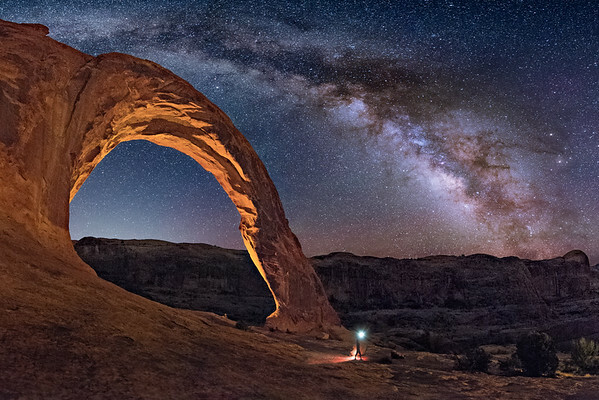 One of the novel features of Corona Arch is that you can shoot the arch from one side and after a couple of hours on one side you can move to the other side and shoot from there, resulting in 2 completely different compositions. If you are interested please contact me using the "Contact Me" link on the menu bar at the top of the page. To secure your place in the mini workshop you will need to send a $100 deposit to me through PayPal. Contact me and I will send you the instructions. You will need transportation (paved roads - we can carpool), a camera capable of capturing night landscapes, a wide angle lens (14-16 mm suggested), a relatively fast lens (f 2.8 suggested), and a sturdy tripod. As the time nears I will send out more information about meeting place and time.